Looking for a place to dine out for Thanksgiving? Or maybe you are visiting Silicon Valley over the Thanksgiving holiday? Here are some of the restaurants that will be open on Thanksgiving Day and options for traditional Thanksgiving meals that are available as take out. Check the restaurant's website for current details about their deals. Also, many of these restaurants require reservations so contact them in advance. 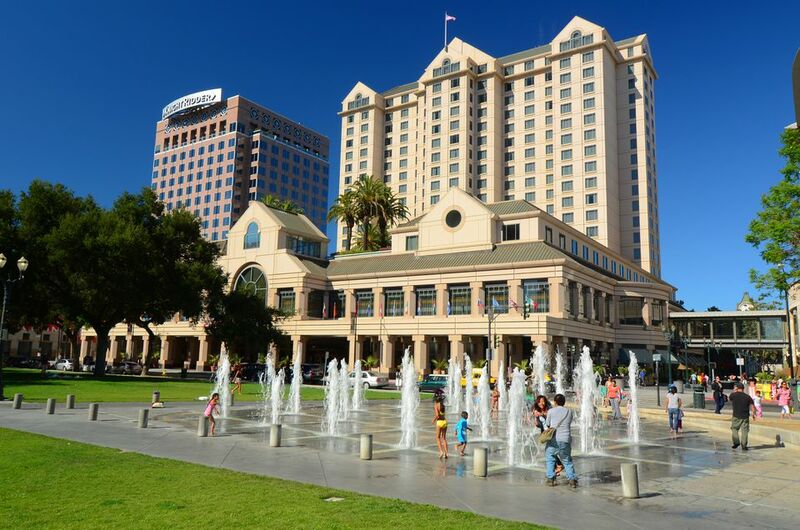 The restaurants at the Downtown San Jose Fairmont are offering two different Thanksiving meal options this year. To make a reservation, call the hotel's holiday events line at 408-998-3960. Harvest Brunch, Imperial Ballroom: A Thanksgiving feast with all the trimmings including Mediterranean rubbed roast turkey with cranberry and sage stuffing, lavender mustard rib eye roast with thyme garlic jus and honey-baked ham with a bourbon mustard glaze. Several Thanksgiving desserts will be featured as well as live piano music. Games will be provided for children. Reservations available 11:00 am - 3:00 pm. Cost: $84 per person; including wine; $74 without wine; $37 for children under 12; children under 5 eat free. For a Thanksgiving lunch buffet option, the Fairmont is offering traditional favorites including parsley, rosemary and thyme rubbed roast Thanksgiving turkey with buttermilk whipped potatoes, candied yams, and roasted Brussels sprouts. Reservations are available 11:00 am - 2:00 pm. Cost: $59 per person; $29 for children under 12; children under 5 eat free. Il Fornaio's three locations are offering two different meal options. Either a traditional Thanksgiving turkey dinner (Cost: $44 adults, $18 children under 12) or an Italian-inspired menu. Reserve here. A buffet feast in the grand hall or on the winery deck. The meal includes a carving station (with roast turkey, beef tenderloin, and rack of lamb) and seasonal salads, hor d'oervres, traditional sides, and desserts. Cost: $85/$95 for adults; $50 for children 7-13; $15 children 3-6; children under 2 are free. Reserve here. A traditional Thanksgiving turkey with traditional sides. Hours: 10:30 to 2:30, and 4 to 8pm. Cost: $38.95 for adults, $18.95 for children under 12; Children under 3 free. Reserve here. For thanksgiving dining on a budget, the Thanksgiving dinner special is offered for $19 for adults and $10 for children. The restaurant's regular menu is also available. Reserve here. Order a complete Thanksgiving meal featuring either a whole turkey or a roasted rib eye of beef, plus traditional toppings and side dishes. To order, please call the hotel's holiday events line at 408-998-3960. Pick up times are from 10:00 am - 3:00 pm on Thanksgiving Day.